Want to generate more restoration sales? - Next Gear Solutions, Inc.
Want to Generate More Restoration Sales? We understand the best practices of effective sales and marketing in the restoration industry that will help you generate more sales. 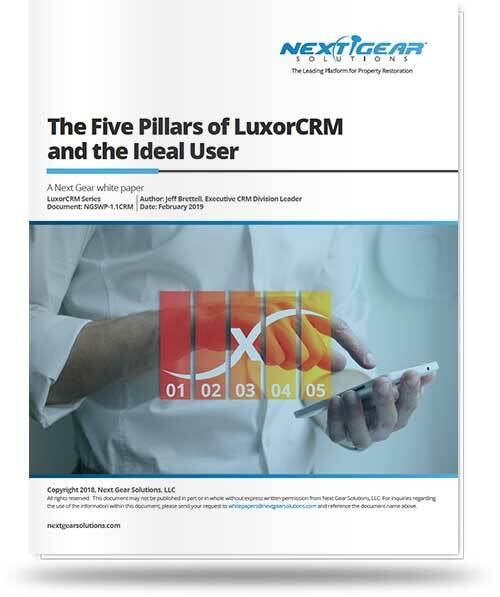 LuxorCRM, part of the Next Gear Solutions suite of products, is the restoration industry’s leading CRM tool and has provided sales consulting to the industry since 2013. Created to effectively develop and implement your company’s sales automation and marketing initiatives, LuxorCRM currently has over 1000 restoration sales and marketing users on the platform and also offers a native mobile application. At Next Gear Solutions, we understand the best practices of effective sales and marketing in the restoration industry and continue to develop LuxorCRM in order to help companies grow their revenue and maximize results. If you can answer "YES" to any of the following questions, download this white paper now to learn about the restoration customer relationship management solution we are continuing to enhance daily. Are you struggling to accurately measure salespeople’s performance?• Have you hired new members to the sales team and now need t oensure they aregoing to succeed? Do you want to improve your efficiency in the reporting and commission process,which currently requires a large amount of manual time andd ata manipulation? Are you struggling to implement sales processes? Are you managing salespeople in remote locations? Have you been experiencing turnover amongst salespeople? As the owner, you are too busy to focus on sales, but wanth te ability to see what isgoing on? Do you have a new revenue goal that requires a stronger apporach to sales? Are you entering a new vertical and want to be able to measure effectivenessand growth? Do you have a sales person with 1 – 3 years’ experience andis not generating$1,000,000 in revenue? Are you hiring your first salesperson and want to be sure they perform? Do you need to generate more sales, but are not planning toh ire any salespeople? Do you have limited time for sales, but want to grow your business? Have you recently lost a critical account and now want to make sure that doesnot happen again?